Even on cold days this winter it is extraordinary how warm it can be on sheltered areas of the beach and undercliff at Hastings Country Park Nature Reserve. The pale sandstone rocks reflect much of suns heat and standing amongst the fallen boulders at the base of the cliffs can feel like you’re standing next to a warm oven! This probably accounts for the amount of invertebrate life on the wing here recently, providing prey for a small number of black redstarts, pied wagtails and grey wagtails wintering on the undercliff here. 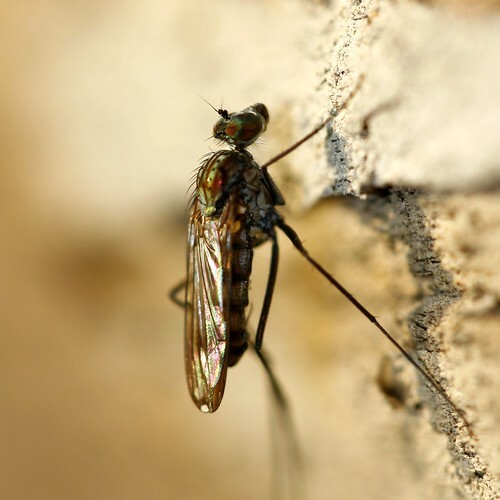 The most notable species on the wing has been the scarce fly Liancalus virens. This colourful fly lives amongst the mosses, liverworts and algae growing under and beside waterfalls and fast running water. The species is very common beside the Ecclesbourne waterfall where the Ecclesbourne stream falls over the cliff edge onto the beach, but can be very difficult to find anywhere else in Sussex. 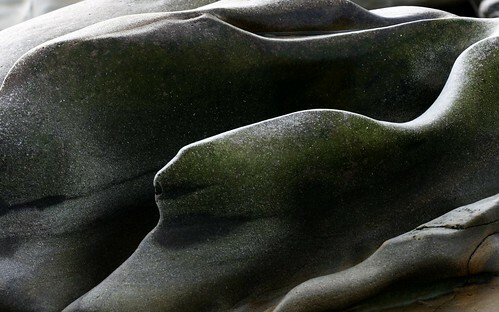 Whilst searching for Diptera sun basking on the hot sandstone rocks you can’t help marvel at the incredible abstract shapes created by the constant sculptural effect of the sea on these fallen boulders. It is important to note that the beach and undercliff is a dangerous place to visit due to frequent landslides, falling boulders and the risk of getting cut off by a rising tide so should only be visited if you are experienced at visiting such terrain and are aware of the risks involved.